Mom and Dad reached out to me when they were a little over 20 weeks pregnant and knew they wanted a Fresh 48 Session. A Fresh 48 Session takes place anytime from birth to 48 hours. Typically these sessions take place in the hospital but can also take place at home, after a home birth. I was so excited about this session, Mom and I chatted a little bit about to expect during this session and how to document the natural moments of the time short after a new baby being welcomed into the world. During this Fresh 48 session I really enjoyed getting to know Mom and Dad. 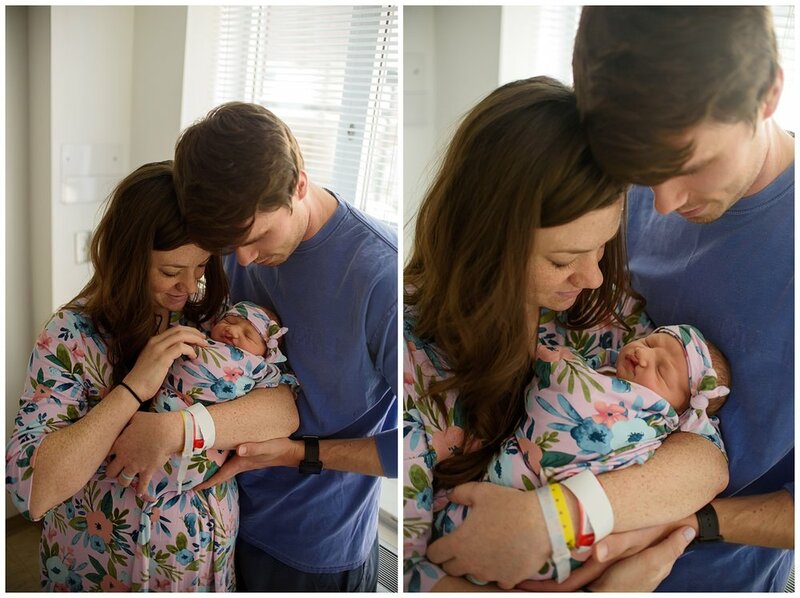 They are first time parents and we talked a little bit about the pregnancy, cravings, and how things had been waiting for their beautiful baby girl! How healthy that Mom craved fruit during her pregnancy, which is not bad at all! We had a fun conversation about Chik-fil-a and I immediately hit it off with them when I realized we are all obsessed with their Cookies and Cream milkshakes. I mean really, why make another flavor? Adalyn was born at 8 lbs 2 oz and 21 inches long. Although she will probably be tall, it was fun to try her into her new clothes and hats that were actually a little too big for her during this session. She's just so fresh and new! Adalyn is such a sweet baby girl, with a great temperament! 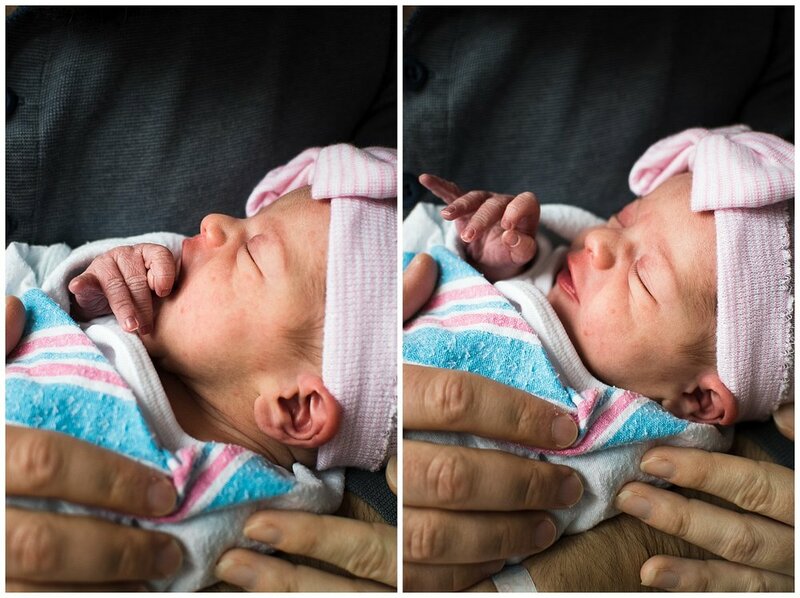 We would put her down to briefly change her, and she showed that she trusted us and she loved the camera so I had to get some photos of her with her eyes open! Adalyn was born with cleft palate and she is as beautiful as can be. Mom expressed to me how much she loved this session and I am so glad they will treasure these images of their sweet girl. Adalyn was such a natural model and worked the camera! How sweet that I was able to get some images of her with her beautiful eyes open, which can sometimes be hard to do during newborn sessions! After a couple of minutes of course when she realized she was cold, she didn't hesitate to let us know how she felt and let out that adorable, high pitched cry that was just the sweetest thing. I had so much fun during this session and I hope Mom and Dad enjoy these images as much as I did! If you are expecting a new little bundle of joy and are interested in a fresh 48 or lifestyle newborn session, I'd love to meet you! You can fill out a couple of questions on my contact page and we will chat! One thing I love about Fresh 48 newborn sessions is that I get to document the in-between moments, the snuggles, the comfort, the naps, hugs, and everything in between. 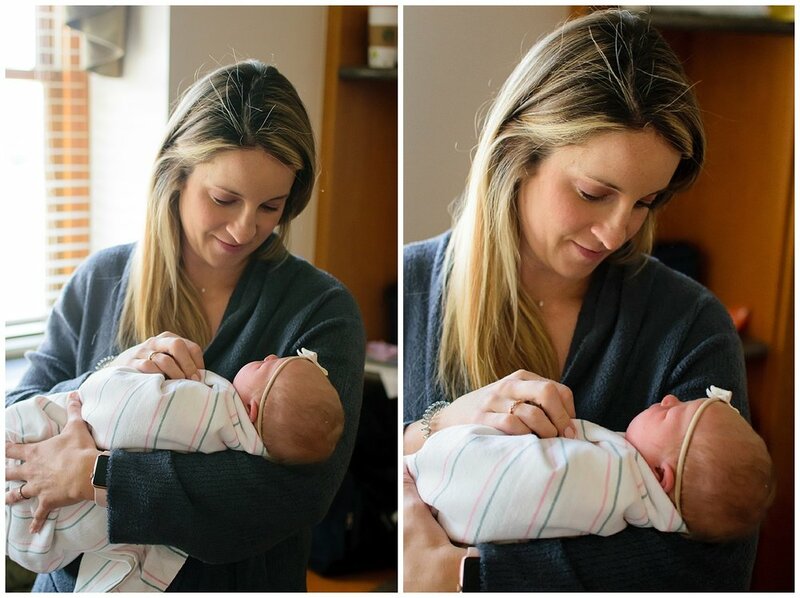 Typically during Fresh 48 sessions, the photos are taken in a documentary and story telling way anytime during the first 48 hours of the baby's life. 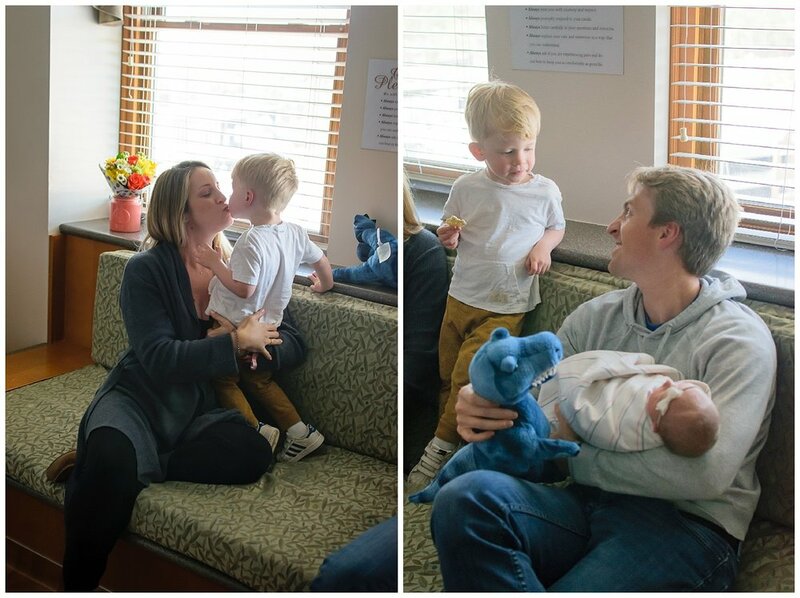 During this hospital session, I spent some time with Mom and Dad while they admired their new baby girl. 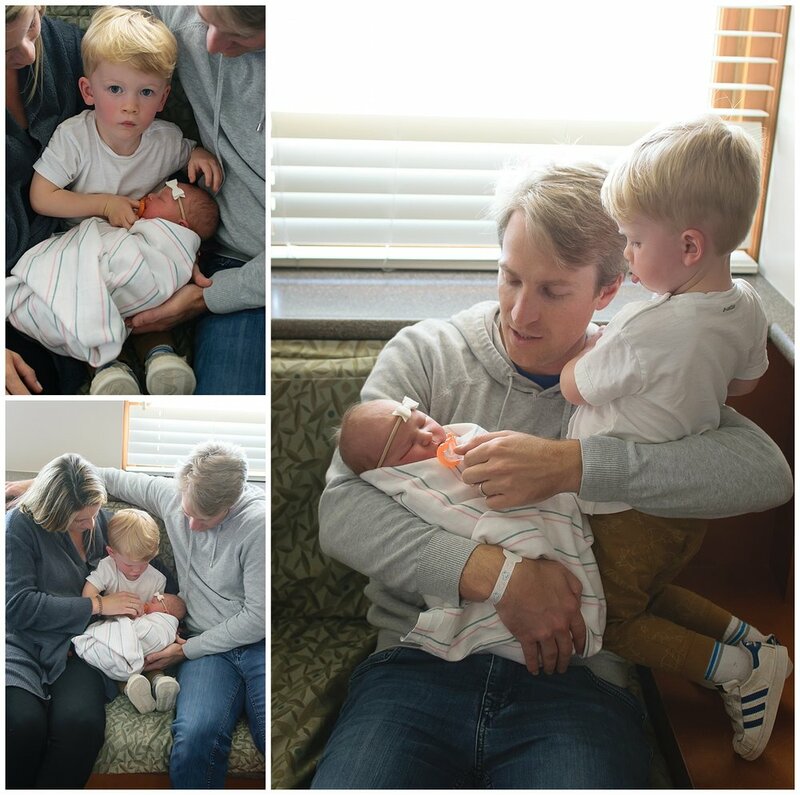 This family was previously a family of three, and it was so fun to help them welcome a new baby girl, to their now family of four. I got to meet big brother and he couldn't have been more excited. He would tell friends and family, "she's here!" and enjoyed holding his new baby sister. He was also really excited to help soothe her with her pacifier. I let him borrow a toy turtle and he seemed over the moon to show her the little toy. Baby Hollis slept so well for us during our session, which made photographing her quite easy. She might have missed out from some love, hugs, and kisses from her big brother, but I'm sure there are many more moments to come in this family when big brother gets to love on baby sister. If you would prefer to have a lifestyle newborn session in the comfort of your home, check out the blog to see this Family of Three and this in home Newborn Session. Head on over to my contact page if there are any questions I can answer for you! 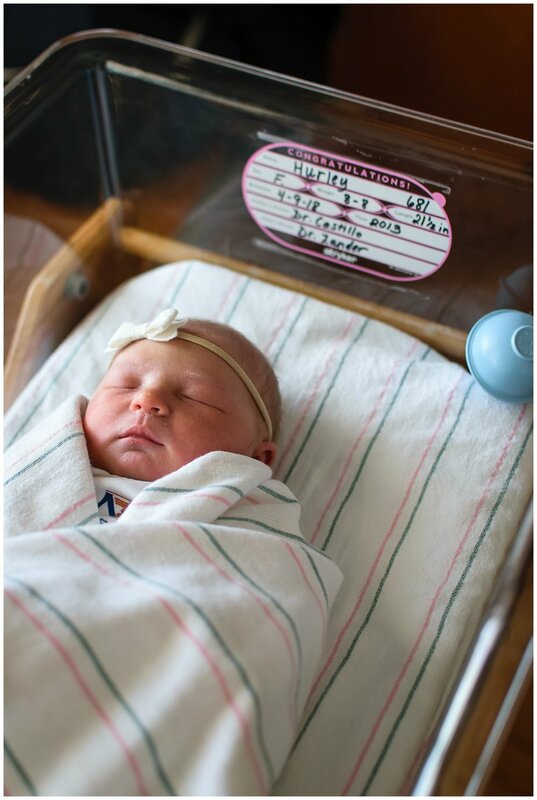 Welcome to the world, Maddie! I arrived to this hospital session being really excited to document this family's Fresh 48 session. For those of you not familiar with a Fresh 48, it's a session that takes place during the first 48 hours of the baby's life. These First 48 or Fresh 48 sessions can take place in the hospital or in the home, wherever the baby spends his or her first 48 hours. I arrived when Maddie was about 24 hours old. Mom and Dad had so much love for her and I was happy to arrive the next morning as they were still getting acclimated to being new parents. Most of the images from this Fresh 48 session are documentary style, so I am there to document the cuddles, nursing, adoring, fussing, and everything else that takes place in a newborn's life. During the Fresh 48 sessions, you also can't forget about taking images of the newborn baby in his or her bassinet, the diaper changes, hospital bands, and getting a good image of the hospital room. The hospital room might not be the prettiest, but the image of the environment helps to tell the story of the Fresh 48. If you aren't sure if a Fresh 48 session is for you, I also offer in home lifestyle newborn sessions. Check out my last couple of blog posts to see how your home can be such a natural backdrop here and here!